But it had no chance when an impromptu gun battle broke out between father and son…. I can’t say I am that precious about the vintage patterns I own – I would much rather see a pattern used and enjoyed, than left laying untouched in factory folds in a collector’s cupboard. And I usually cut around the pieces. Maybe I should trace them first, but my thoughts are that although cutting might devalue it from a collector’s point of view, they are still usable for the next sewer who comes along – and after all this is who they are intended for. 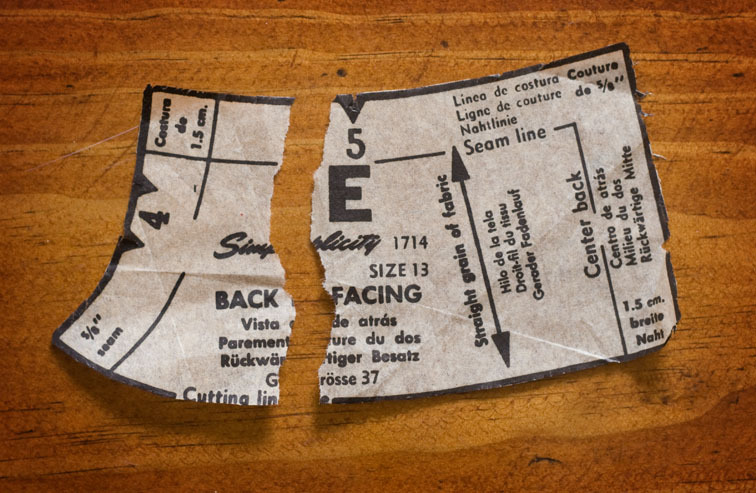 Otherwise I do care for my vintage patterns and don’t like to see them damaged unnecessarily, like – huh hmm – my one was. 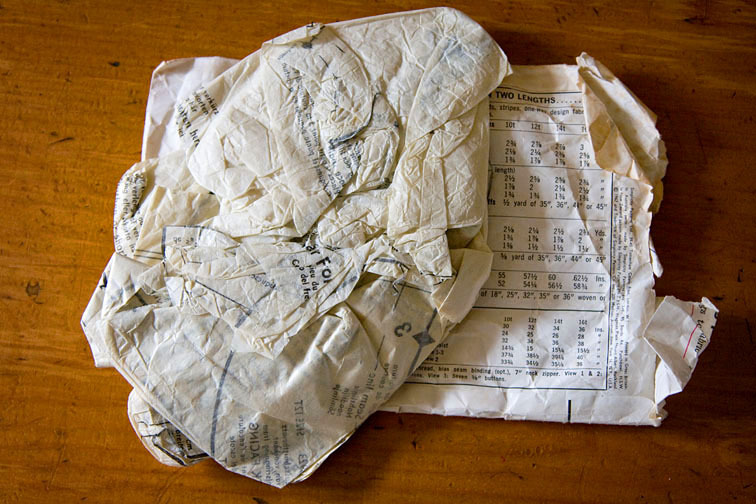 How do you treat your vintage patterns – do you treat them with kid gloves, or just shove them back into the packet like this one?! At what stage does a pattern become valuable enough to deserve The Special Treatment anyway – age, fashion relevance, or the ferocity of the bidding war? 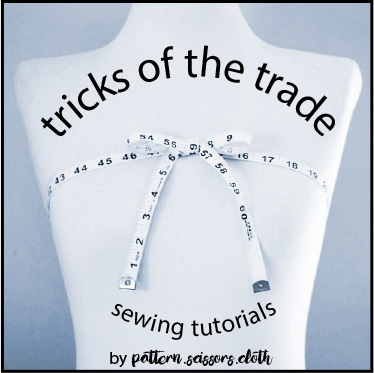 I’d only ever pay a few dollars for a pattern because making them is my day job, but there are some very simple designs that command very high prices as The Selfish Seamstress notes today. Don’t you think it is interesting that the perceived value of vintage patterns varies so widely? If 1 is trash and 10 is treasure, where on the scale do you sit? The 1956 All Black Dress – More Pics! I am trying to look after my patterns better. But I confess to sometimes shoving things back into the pack. Depends on how much I love the pattern. My vintage vintage patterns I trace rather than cut (assuming someone hasn't already done it for me). I cut all my patterns. I am not too precious about them. Like you I figure they were made to be used so I may as well use them. And like you say they are still usable by someone else. I have a pattern that I cut out and is now being used to make dresses for 3 different people for my bridesmaids dresses. The functionality is still there. I don't put my pattern pieces away soon enough. My house is breezy and I am often retrieving missing bits from under the couch or other bits of furniture. I spent one day fluttering bits of paper off the verandah in the hopes that they would lead me to the pattern piece that the wind had taken away. I trace all my patterns – modern and vintage – mainly because I have to make quite a lot of fitting alterations and, for safety's sake, I feel happier preserving the original in case I have to go back to it. When it comes to vintage patterns, I do treat them with a little more care than modern ones (I keep them in plastic envelopes) because they tend to be fragile but I don't think I am obsessive about it. My general view is that these patterns were made to be used and enjoyed! To date I have been cutting my patterns too – carefully – and gently ironing, and folding neatly. Tracing them out just bores me silly, which is probably why I don't sew more Burda mag patterns! I have yet to get close to sewing my most special patterns, but these are the rather old sort that have no print on them and already come as separate pieces, so I guess I will be trying to cut just outside of the pieces when I get to them. With multi-size patterns if I cut a smaller size I keep the trimmed off larger sizes and fold and pin them to the original in case the next user (could be me) is larger. I'm a tracer. I sewed for so long without patterns they still seem kinda sacred and magical to me, and I hate the thought of damaging one. (I have been known to use “vintage” (70s) patterns as-is if they're cut out already, at least for the skirt pieces, because tracing out those big pieces is a pain, but it requires the weight-and-trace method because I don't want to pin them and I'm not very good at it.) I make enough alterations to most bodice patterns that I'd generally rather trace. As for your back-neck piece, I'd probably make a quick tracing in tissue and put that in the envelope too, just so it's ready if you want to make the pattern again. Conversely, I have a really hard time paying more than a buck or two for a pattern. Weird, yes? Ha! I love that photo of the crumpled up pattern. I have definitely done that before in a fit of rage over a crappy pattern– but of course never to a vintage pattern. I'm pretty careful with the few old patterns I own. But I guess the new patterns will be vintage one day, too…. Something is a treasure only so long as someone wants it. I try to be as careful as possible with all my patterns, on the assumption that they can be used again (by me or someone else). Accidents do happen, and for this I've found that paper surgical tape is the best way to fix. I've never bought a vintage pattern! It all seems like too much work when there are more interesting patterns to sew than I have time for already! I read SS's post about her rare pattern and really puzzled over why that particular pattern is so sought after. Maybe because I know enough about drafting to draft it myself (or where to find drafting books in the library) it looked too simple to me to warrant such insane prices.It would take way more complicated draping than that to really get my lust going! Selfish Seamstress is a hoot! Just love her take on those who covet her patterns. I usually trace patterns, especially since they started coming in multiple sizes and since I usually have some alterations. I started tracing with a shirt pattern for my then 4 yr old and copied every size. Every time he outgrew a shirt I made a new one. Now I even trace a .99 cent sale pattern. But I will toss a pattern if it proves to be poorly drafted. I always trace my patterns, except for downloadable versions. I know it takes longer but I am never sure of the size I choose so I might have to alter it or make another size all-together. I trained as a museum technician so obviously I'm overly cautious with everything. Add to that the fact that NO sewing patterns or magazines are sold in my country anymore (too poor, not enough clients for the market) and that I have to jump through hoops to get the ones I have so…hopeless tracer/filer/kid glove handler, LOL! My cats have one much of the same to one of the few vintage patterns that I own. They love the old tissue for some reason. Though it would be silly to get upset about it, they're just cats and it's just tissue after all, I now make sure they can't get anywhere near when I want to work with the tissue patterns. And, I trace more often than not these days. Sorry about your little pattern piece. I hope it won't rest too heavy on you for long. I love vintage patterns. Some of them a real treasures, others, just boring. But since they deteriorate so easily, I had to find a better solution for storing. I store envelopes in acid free plastic pockets in a binder, and instructions in mailing envelopes. However, vintage patterns seem to take over my time it seems, so I am now editing down my collection. I don't want to own too many – only the most favourite ones. So, if you like the pattern treat it well. If not, pass it to someone else. I cut all patterns — around the pieces. I learned to lift an edge and mirror my scissors cut to the selected size line, so I can preserve multi-sizes without tracing. I use gallon-sized plastic freezer bags to store patterns: instruction sheets go inside pattern envelope goes inside bag. Fold pattern pieces so name of piece is visible; put all pieces in bag behind pattern envelope. Squeeze out air as you zip bag shut, for flatter storage. This has the added benefit of discouraging vermin from eating your paper patterns. All my “vintage” patterns are from the thrift store and were about 25 cents so I can't make them too precious. Plus I spent a great deal of time and money at fashion college so I could always make a similarly styled pattern of my own. I think if I were going to have to alter the pattern I'd trace it off, if not I'd cut it out and use it.